Generation Pay It Forward (GPIF) is a fundraising campaign with the goal of ending weekend hunger for 6th and 7th graders in need in the Johnston School District. This will be accomplished by raising the $21,000 needed for the Johnston Partnership , a local non-profit, to bring the Friday Friends program to Summit Middle School. Friday Friends is a program that provides food for schoolchildren on the weekend, when free and reduced breakfasts and lunches are not available. The Partnership has identified Summit as the school with the greatest need for a Friday Friends program currently. Any students who “graduate” out of elementary buildings with Friday Friends programs do not receive the same support once they start at Summit due to the lack of an established Friday Friends program there. This fundraising campaign was developed alongside the Johnston Partnership and is being spearheaded by Johnston High School young alumni. We recognize the power of us as individuals joining together to achieve something greater than ourselves. In addition to realizing the outcome of fewer hungry kids, we’re also seeking to connect the young alumni of the Johnston school district — a generation one might say — with the schools and community that invested in us growing up so that kids who follow receive just as strong of an investment. We are the pay it forward generation. 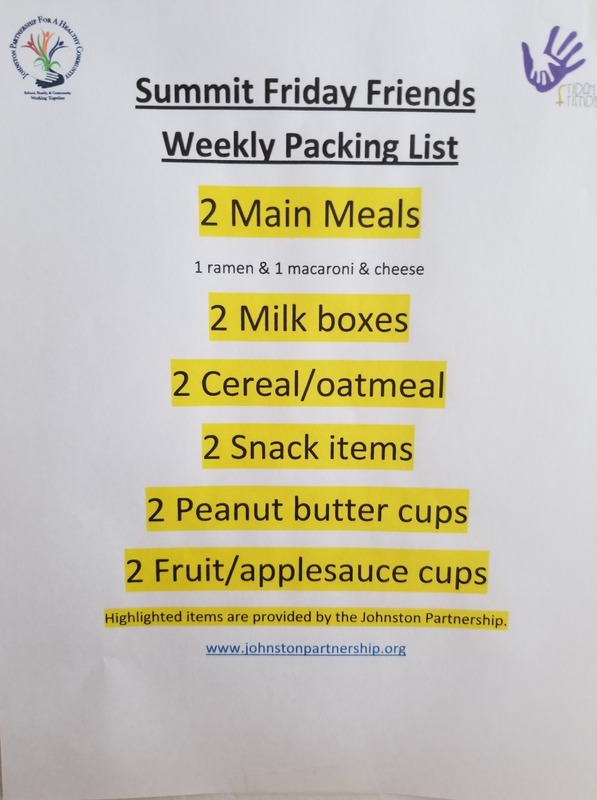 In case you missed it, thanks to your financial investment the first delivery of weekend food bags went home with students as of March 2nd (see attached pictures from The Johnston Partnership). Many thanks to the Summit counselors, principal, staff, and PTO, as well as the Johnston Partnership's Andrea Cook (director), Barb Allen (board president), Judy Anderson (board member), and countless others for all of their work over many months in order to get this program off the ground. We are all indebted! An update on the status of bringing Friday Friends to Summit: Today, the Summit counselors, principal, and Andrea Cook (director), Peggy Martin (board member), and Judy Anderson (board member) from the Johnston Partnership met to discuss the logistics of bringing Friday Friends to Summit after $25,000+ in funds were raised through Generation Pay It Forward ( www.generationpayitforward.com). Very good news — the program will launch on March 1 of this school year, nearly six months in advance of original schedule. They are planning to enlist volunteers to bag the food items, deliver to the school, and then the counselors are working to craft a way to very discreetly deliver or otherwise provide students access to the bags on Fridays at their Home Base (homeroom) before they leave for the weekend. 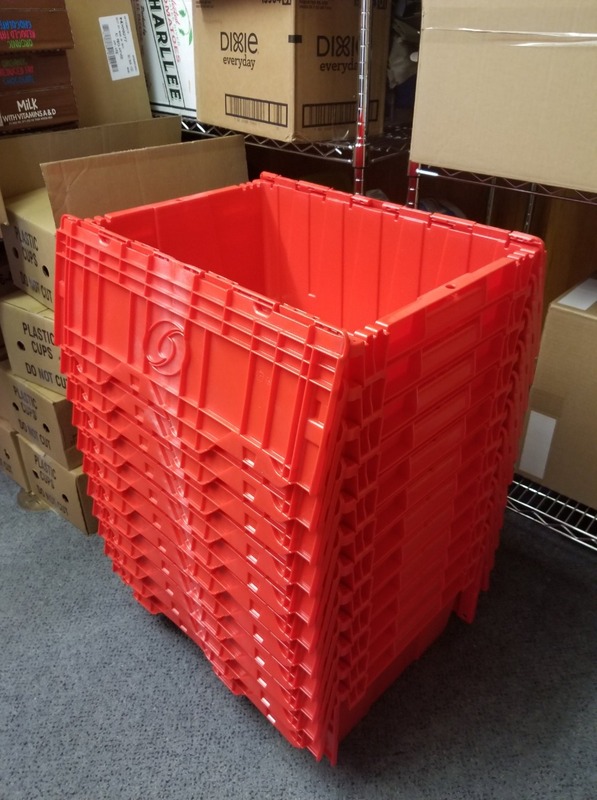 Food selection will be based on need for this age of students, but will be similar to the food packed for the Friday Friends kids at the elementary level. Very excited to be able to share this news with you and thanks again for your contribution(s) that made this possible! We did it! A gigantic THANK YOU to all of the individuals, businesses, and organizations that contributed to our Generation Pay It Forward initiative. With the most recent influx of individual and offline business donations, our young alumni have now raised over $25,000 during the past 4 months! As one of our donors, we wanted you to be among the first to know. 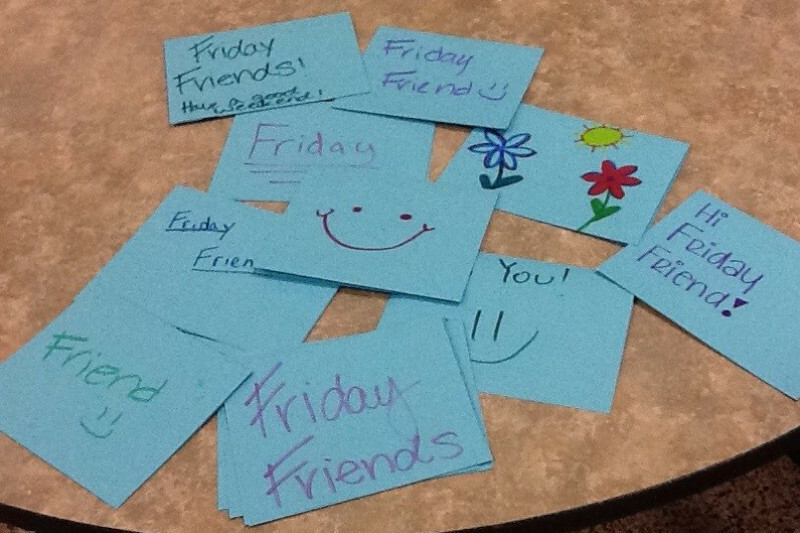 All of your donations and support have made it possible to bring the Friday Friends program to Summit 6th and 7th graders in need starting next school year — so thank you. Additionally, thank you to the dozens of JHS young alumni who signed up to become founding members and tapped the power of their own networks to make a difference. Their names and all of the community partners who rose to the occasion to help us can be found at www.generationpayitforward.com. We'll be ending this GoFundMe as our goal has been reached, but if anyone would like to contribute to The Johnston Partnership going forward, they can always do so at http://www.johnstonpartnership.org/. Thanks again for your investment in Johnston and being a part of this journey. Since the start of GPIF three months ago, young alumni have raised a total of $17,759! This includes $12,964 raised online and $4,795 from offline donations such as employer gift matching programs or Pay It Forward Day proceeds. That means we are only $3,241 short from reaching our goal of raising $21,000 to bring the Friday Friends program to Summit! Please continue reading for how you can help us raise this final stretch of money. Since our last update, we're lucky to have had the Summit Middle School PTO join other partners like The Herb Block Foundation and the Johnston Urbandale Soccer Club to support our efforts and make a generous donation to our cause. Founding Member Amelia Medici (JHS '12), along with Founding Members Abby Dusen (JHS '12) and Molly Thuente (JHS '12), have been continuing to organize Pay It Forward Days in conjunction with local businesses. As noted in the last update, Gusto Pizza offered to host a Pay It Forward event for us. It was held on November 7th and helped us continue to chip away at our goal. Thank you, Gusto! New since the last update, we have two upcoming Pay It Forward Days. 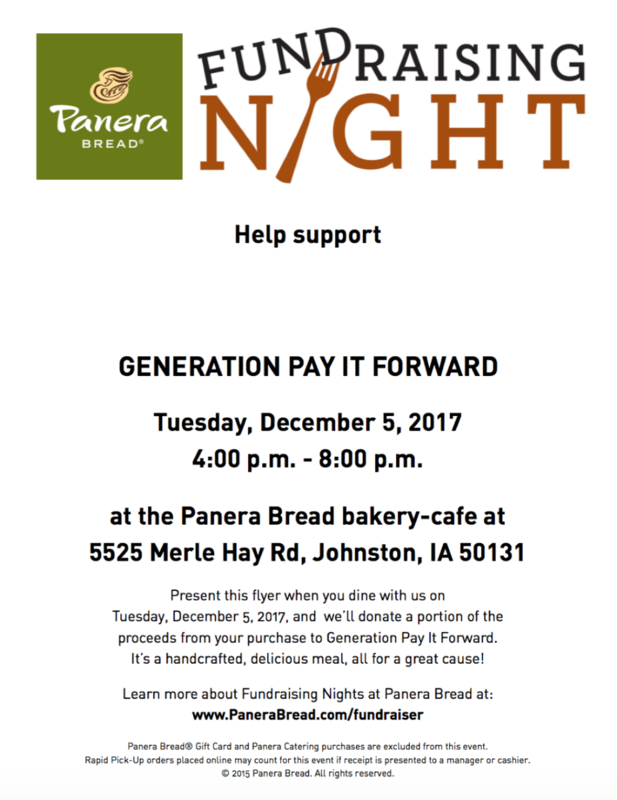 One, at the Johnston Panera on Tuesday, December 5th from 4pm-8pm, where they'll donate a portion of proceeds to our cause as long as you present the attached flyer. 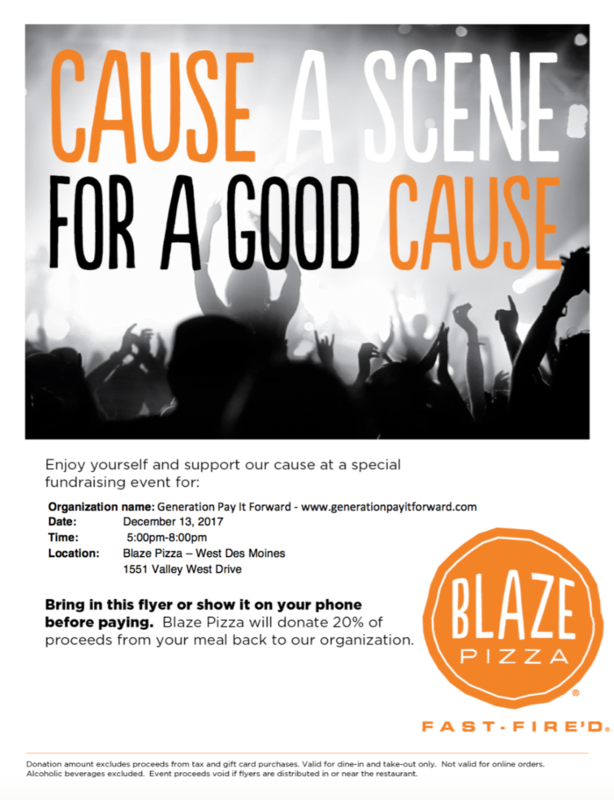 The second Pay It Forward Day will be hosted by Blaze Pizza - Valley West on Wednesday, December 13th from 5pm-8pm, where they'll donate 20% of proceeds to our cause as long as you present the attached flyer. If you can spare a minute, please help us make these events a success and spread the word to your friends and family by posting on Facebook and/or Instagram. Thanks for reading and for your help in making all of the above possible! As always, feel free to reach out with any questions.